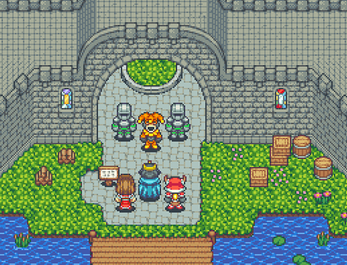 Bring your game to life in crisp pixel art with these RPG character sprites. This pack includes a wide variety of characters that feel like the classic RPGs of the SNES era. NEW: Check out the RPG Battlers expansion pack for additional animations for these characters. Can you make an action rpg verson of sprits with attacks? what size tiles are these? when will we get 8 directional characters? Is it possible to purchase one set now and get a discount on the full bundle later? I love to use this in my game, but we are low on funding at the moment. If I get these from the RPGMaker guys, is the license for any Game engine or is it for RPGMaker only? 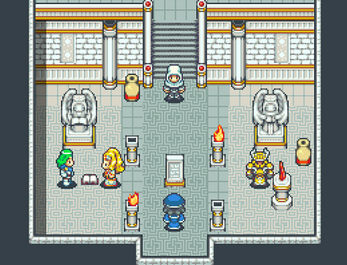 I'm asking because you said that the RPGMaker version had the tileset and characters while these are separate here. Are these compatible with the RPG Maker MV? Would you say that this works well with the Old School Modern Asset pack? Sorry about the repeat question. Hey there bossblues. First of all, insanely amazing work on all of your sprites. You are the reason I've bought RMMV few days ago and I'm having a blast so far. 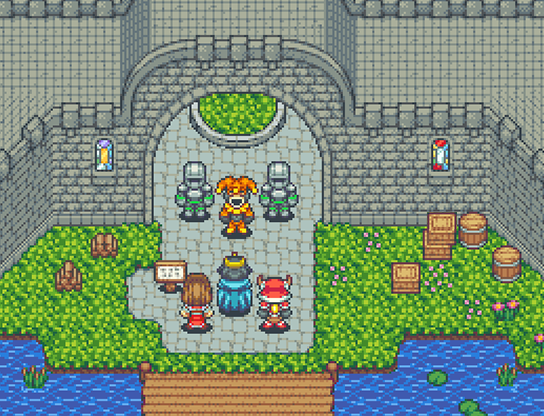 I feel like reliving Chrono Trigger but I'm the one telling the story now. 2. Your Patreon expansions (Mythical Monsters and Lich Crusaders), are they included in any other packs or are they exclusive to donating via Patreon? If they're available only through Patreon, you should definitely point it out somewhere visible for others, otherwise, many will miss these gems. 1. If you get the pack from the RPGMaker folks (on Steam or RPG Maker Web), then that pack includes the characters and tiles. 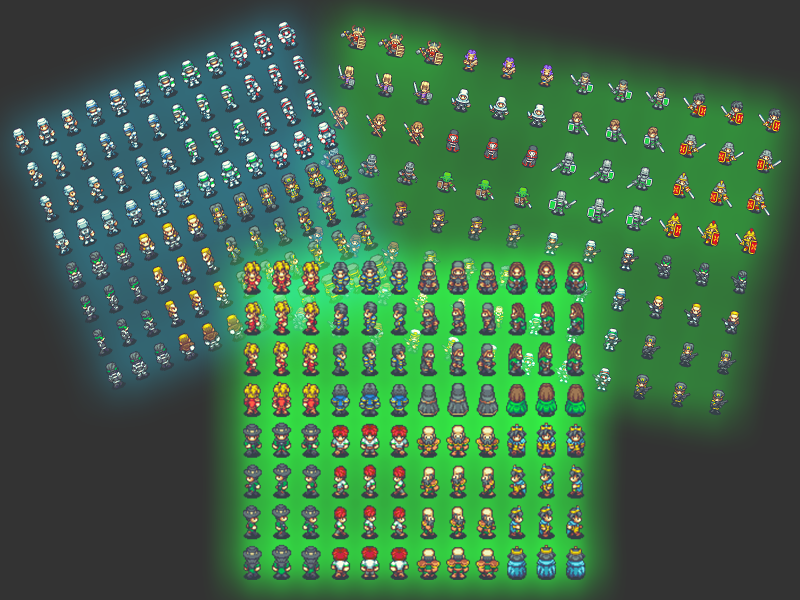 On itch.io (and other sites with the general license), the character and tiles packs are separate. 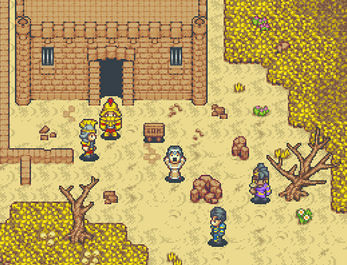 So if you have the base Time Fantasy pack via an RPG Maker source, then you would already have the content from this pack and the base tileset pack. 2. The Mythical Monsters and Lich Crusades packs are exclusive for patreon. All unique content! Looks interesting, unfortunately I can't afford for this. When I downloaded the pack, the base tileset doesn't include chara1 or vampire sets. Is there any way to get them at the smaller size? Actually, I noticed the doors and lava aren't included at each size either. I am little disappointed with this purchase. The "3-frame weapon or action pose" 90% of them seam to be the action pose of which the 3 frames are identical (just holding a weapon). 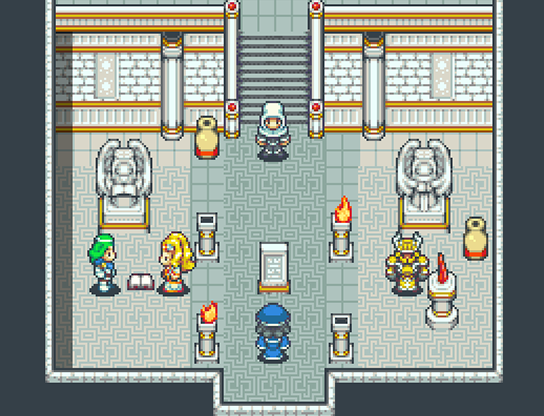 Those that have attack animations they are only in one direction not in 4 directions like you would see in the older Legend of Zelda games for example. I just purchased these but cannot figure out the grid size for the sprite sheet. 26x36 seems close? The cells for most of the sheets are 26x36 yes. Some special sprites may be a little bigger. 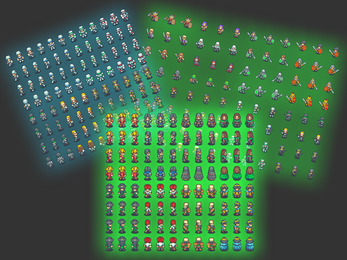 The sprites themselves are made to look good on a 16x16 tileset grid. hello, whats the licence of your charakter sprite packs? can i make a char maker with your pics and sell the tool? Maybe. You can't resell the graphics so it's borderline -- Send me an email with some more details and I'll take a look. Love all the packs. Is there any way to purchase them all as a single pack? is this for commerical use? i want to add this asset to my engine as the default images and then sell the engine with it. It's for commercial use for individual projects but not for reselling-- if you're selling an engine that's a special case, it might be reselling. Send me an email via timefantasy.net and maybe we can work something out. These are the originals. Any other packs came after, as expansions to this one. Hello, I first wanted to say that your art looks amazing. And secondly, will purchasers be able to get these expansions for these attack animations for free or will there be a add on price? Hi there, I'm so glad I found you because I love your art. Do you have a gif or a video showing the character weapon animations/action pose? I would like to see that before I purchase this if possible. Thanks! can i change the sprites? Change color or add items? Looks awesome. For the heroes/villians when you say. Do you mean actual attack animations for say an action battle system? Just want to be clear on that before I make the purchase.